From the moment the music begins, the foundation of an exceptional musical experience is evident. Sound emerges from an inky black background, revealing microdetails and performance cues typically reserved for the live performance. Substantial, fundamental bass underscores the event with resolution and textural accuracy. Space around performers and groups of instruments stretch before you onto a lifelike stage with scale and body. Dynamics swing from silent passages to grand fortissimos without effort or strain. This is high definition listening. 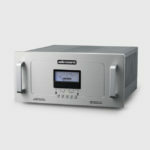 POWER OUTPUT 250 watts per channel continuous from 20Hz to 20kHz. 1kHz total harmonic distortion typically 0.5% at 250 watts, below .04% at 1 watt. Approximate actual power available at "clipping" 270 watts (1kHz). (Note that actual power output is dependent upon both line voltage and "condition" i.e. if power line has high distortion, maximum power will be affected adversely, although from a listening standpoint this is not very critical. )POWER BANDWIDTH (-3dB points) 5Hz to 70kHz.FREQUENCY RESPONSE (-3dB points at 1 watt) 0.5Hz to 110 kHz.INPUT SENSITIVITY 2.4V RMS Balanced for rated output. (25.5 dB gain into 8 ohms.) INPUT IMPEDANCE 200K ohms Balanced. OUTPUT TAPS 4, 8, 16 ohms. OUTPUT REGULATION Approximately 0.9dB 16 ohm load to open circuit (Damping factor approximately 10). OVERALL NEGATIVE FEEDBACK 8.8dB. 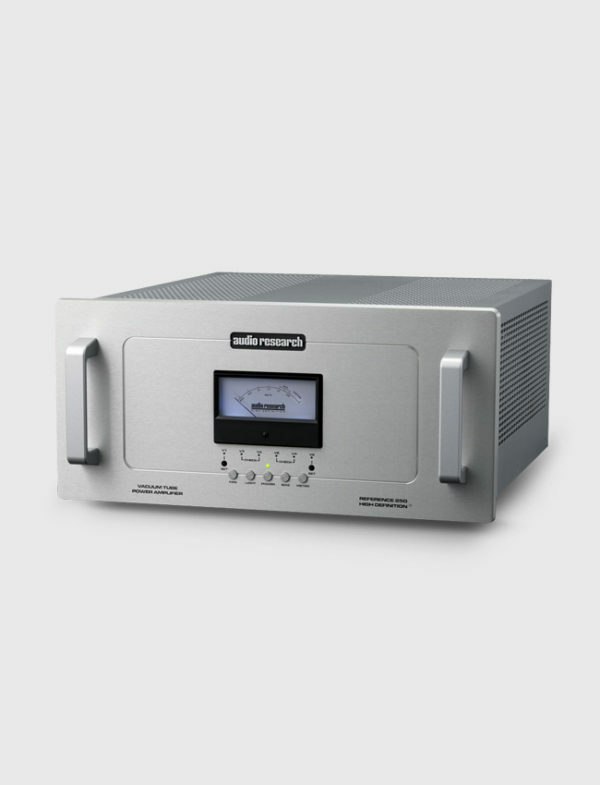 SLEW RATE 20 volts/microsecond.RISE TIME 1.5 microseconds.HUM & NOISE Less than 0.2mV RMS – 110dB below rated output (IHF-A weighted, input shorted, 16 ohm output).POWER SUPPLY ENERGY STORAGE Approximately 900 joules. POWER REQUIREMENTS 105-130VAC 60Hz (260-250VAC 50Hz) 770 watts at rated output, 1000 watts maximum, 380 watts at "idle," 1 watt off. TUBES REQUIRED 3 Matched pair KT150 (Power output V1-6); 1 Matched pair KT150 (Driver V8-9); 2 6H30 (Gain stage V7 and Regulator Driver V10); 1 6550C (Regulator V11). DIMENSIONS 19" (48.3 cm) W x 8.75" (22.2 cm) H x 19.5" (49.5 cm) D. Handles extend 1.5" (3.8 cm) forward.WEIGHT 73lb or 33,2kg Net; 88 lbs. (40 kg) Shipping.